Posted in Daily Outfits, Fashion, Travel. There was a time in life when I could describe myself as a regular festival-goer. I went to my first in 2002 (Leeds Festival with Metallica, System of a Down, Blink 182, Linkin Park, Blur and The Streets. Oh my!) and for the next few years, my friends and I would get together every summer to watch live music, come rain or shine. But then I hit an age when sleeping on the cold, hard, often wet ground, surrounded by empty bottles of cider with no access to a decent bathroom, was no longer a fun way to spend the weekend. I admit it – most of the time, I’d rather watch it on TV and go for a wee without fear of catching Hepatitis. I know, I’m pathetic. It’s been a few years since my last festival and even though the desire to roll around in mud and eat potentially life-threatening burgers still evades me, I’m itching to get back in that atmosphere. Plus, dressing for a festival is possibly the most fun you’ll have with your wardrobe. See? So fun! I think it’s the wellies. Wellies make everything better. 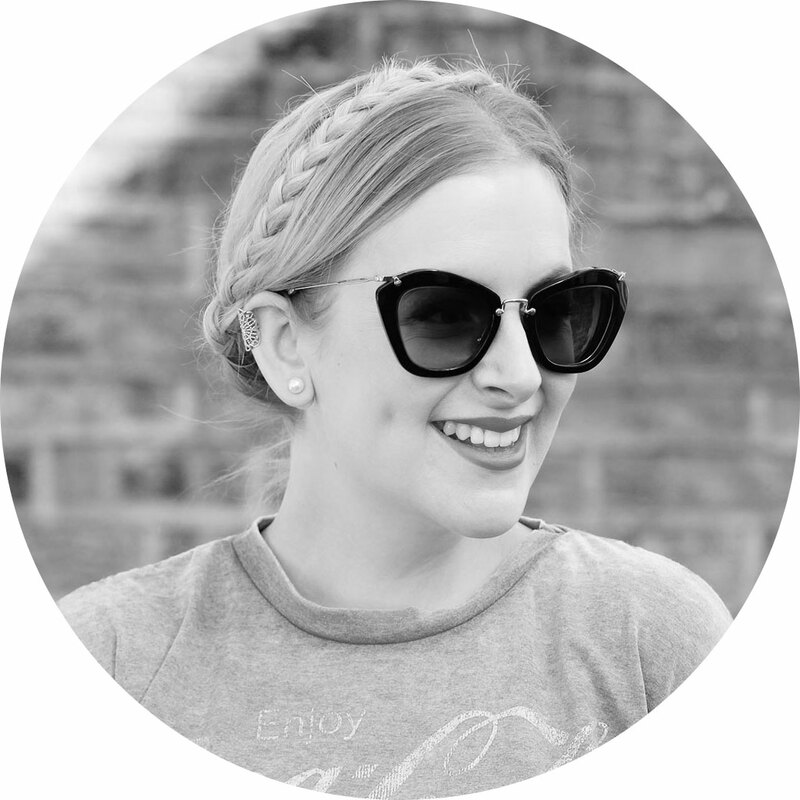 Mine were sent to me by the lovely people at Hunter – they’re the Original Gloss style in ‘citrus’ and the most fun wellies I’ve ever owned. And I have about five pairs of wellies, so that’s saying something (I live in the north. We need wellies). Dressing for a festival can be tricky, but the key is a mix of the practical and the pretty. I found this vintage dress in a charity shop in Brighton – it was a rather long, matronly style so I chopped the bottom off for a more modern look. I love the bright florals and the loose cotton fabric is comfortable and easy to wear. Plus, if it gets wet it’ll dry quickly! Over the top I’m wearing a waterproof jacket from J.Crew – an essential for British festivals and much nicer than those transparent plastic ponchos. A cross-body bag, like this vintage leather one, will keep your essentials close and safe, while a straw trilby keeps the rain off your head and hides a multitude of hair sins. 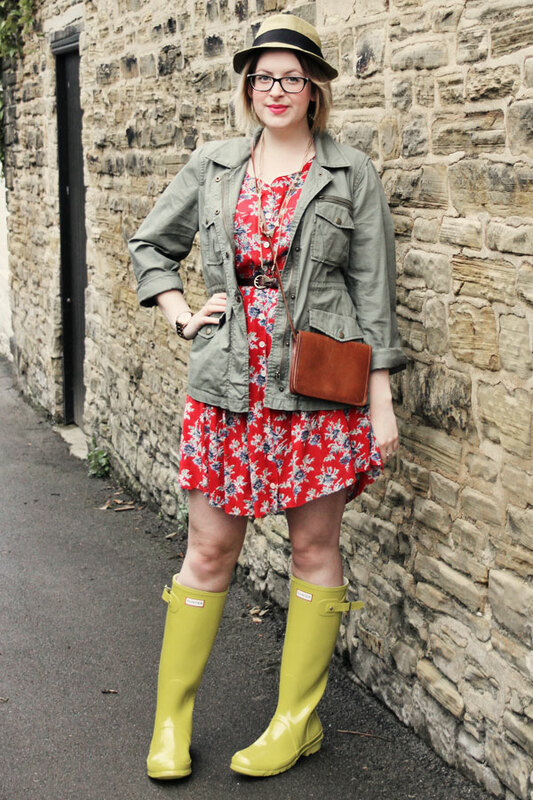 And the most important aspect of your festival style – wellies. No plimsols. Converse won’t cut it. And don’t even attempt sandals of any kind. It’s wellies or bust, unless you want to come home with trench foot. I don’t have any festival tickets this year, so this outfit may not see the light of day. Unless you vote for me here – I’ve been chosen as a finalist in Oxfam’s competition to win tickets to the Isle of Wight festival! If you like the cut of my jib and think I deserve a few nights in a tent, just leave a comment with my name (JenLittleBird or Jen Holmes or just Jen) to vote. Voting closes 9am tomorrow – thank you kindly! Are you going to a festival this summer? What are your tips for festival fashion? I also used to be a regular festival go-er, my first was Reading 2004 (The Offspring, Ash, Green Day and, erm, The Darkness). Your outfit looks great; unfortunately there are photos of me on facebook wearing a hood that I’d fashioned from a bin liner. Creative? Yes. Stylish? Absolutely not! You look great though! Oh that old festival line up you mentioned brings back memories! I used to relentlessly listen to all those bands again and again! But yeah if you don’t have wellies you might as well just go home. Been to Leeds festival about 3 times and each year it was as muddy as hell. Your wellies are so charming wish I could afford Hunter’s but always ended up having to wear tragic Dunlop khaki ones. And yes the toilets are horrible. Everytime I went in there I thought I was going to fall into its realms and die. Poo girl style. Ahhhh what an amazing year to go! I went to Reading in 2007 and it was enough to put me off ever going again. I’m so glad i did go and it was an amazing experience but it just wasn’t for me! I really like your outfit, you’ve got the festival thang~ perfect! I love that dress. Festivals are so fun! You look so fabulous. 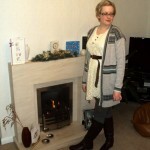 ooo pretty dress and I love the colour of your wellies! I wish hunters would fit around my chunky calves! Ah festivals, I went to Glasto solidly for 5 years. LOVED it. Felt like a different world, and my headscarf, shell bracelets and chiffon mirrored triangle top just didn’t cut it back in the real world. Love the dress, and the wellies are perfect! Mine were old green ones that I cut in a fringed pattern at the top. Stylish. Got my vote Jen, good luck. What a great Leeds lineup, wish I’d been there! I’m definitely the festival type, I wish I could have afforded it in my teens though as I think I’d have had more fun back then! Nowadays I think I’d go for something more chilled like Latitude or Hay festival. WOW Jen, I like your Outfit, you look really adorable wearing your Dress and Wellingtons, perfect Festival attire. I love Wellies and you look really dishy wearing your Wellies on bare legs,that’s how Wellies should be worn. Perfect festival outfit, I think that deserves a vote! I have never been to a festival and i doubt I ever will but those wellies are fab enough to tempt me! Dream line up, or what?! Lucky! 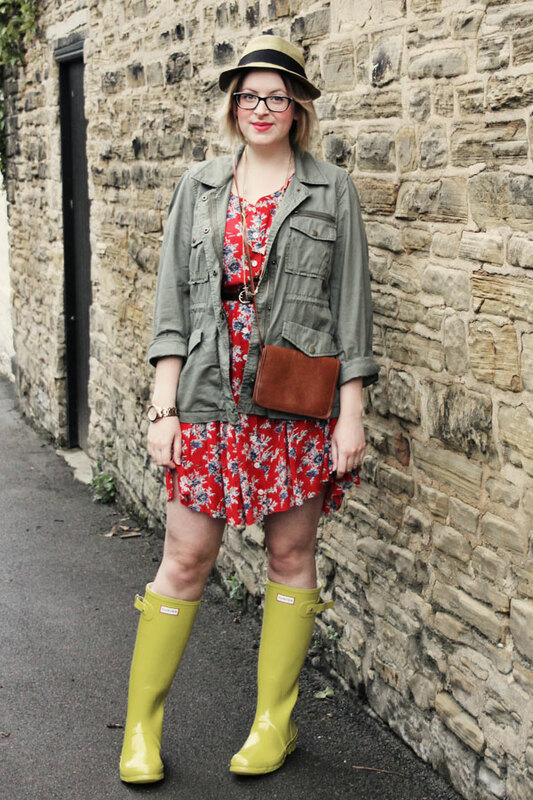 I agree, wellies are a must have festival staple.. I can never understand people traipsing around in sandals! Can you give us a hint on the method you used for chopping the bottom of the dress?! It looks great! The quality information is presented in an easy and understanding manner. This is very nice to see this blog and it’s really informative for the readers.